Slip and Fall Accident Recovery Checklist | Hupy and Abraham, S.C. 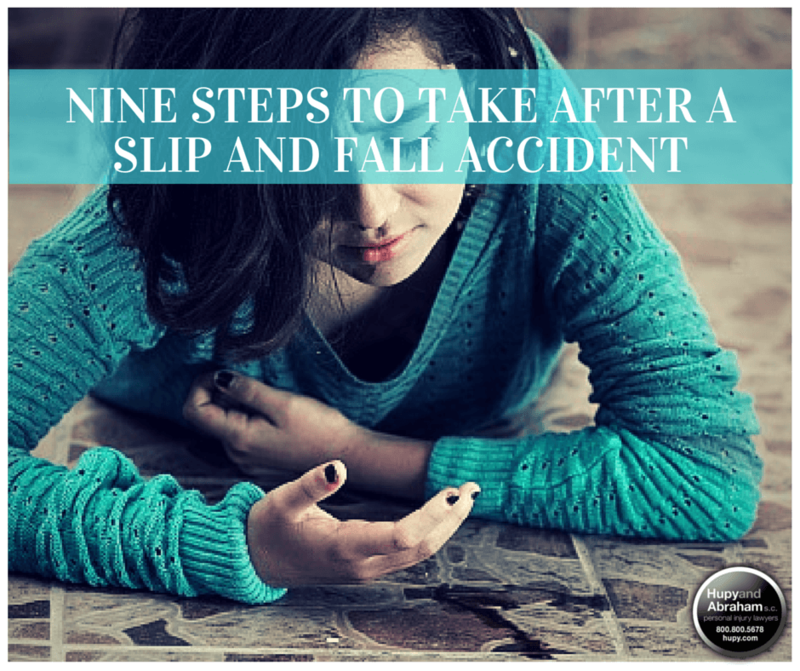 If you have been hurt in a slip and fall accident, then you likely have a lot on your mind. You have to figure out how to manage the pain from your fall injuries, how to pay your medical expenses, and how to pay your bills while you are out of work. At the same time, you are managing everything that was on your plate prior to the accident. However, our personal injury lawyers want to make it as stress-free as we can for you. Accordingly, we encourage you to follow our checklist and to learn more about tips and resources that you can help after a fall. Stop and wait. Do not jump up immediately after you fall, but instead figure out where you might be hurt and whether it might be dangerous for you to move before emergency personnel arrive. See a doctor. Only a doctor can diagnose your injuries and develop a treatment plan. Follow your doctor’s orders. Rest, get further treatment, and participate in rehabilitation services, as recommended by your physician. File an accident report. Many businesses and other public places have accident report forms available, but sometimes you must ask for one. Filing this report can help you with your legal recovery. Take pictures of the accident scene, if possible. This may be important when you need to prove why you fell. Write down the names and contact information for witnesses who saw you fall. Witness testimony can also be important in determining the cause of your fall. Make notes of any unusual circumstances at the accident scene. Was the floor slippery? Was a stair broken? Was the lighting bad? Were there any other circumstances that led to your fall? Be cautious about speaking with insurance agents. What you say can be used against you and the settlement that is being offered initially may not cover all of your expenses. Talk to a lawyer experienced in slip and fall cases. An attorney can make sure that your rights are protected. The failure to take any of these steps does not mean that you do not have a viable slip and fall case. However, if possible, it is important to follow the steps described above to protect your recovery. For more information about how to recover from your slip and fall injury, please contact a lawyer to discuss your potential case. We can be reached at 1-800-800-5678, and we would be pleased to provide you with a free, no-obligation consultation.